Hammer Balls from Plan Toys is a curved wooden box with three colorful balls and a mallet, this toy helps children to improve hand-eye coordination, aligning, slotting and aiming. Pound the balls and watch them roll out one by one. It is now one of my all time favorite toddler toys. We got Hammer Balls for our 3 year old son as a green Christmas gift and not only does he love it, his older siblings do to! It is just a simple wood block with a lovely curved shape that has three holes in it. You place one or all of the three colorful, wooden balls on it and then you use the hammer to pound the balls through the holes. They roll out from underneath and the fun begins again. The concept is incredibly simple but it is fascinating to most young kids. It is similar to the idea of wack-a-mole but without the violent concept of striking an animal. 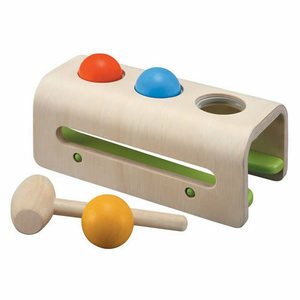 Early childhood learning involves playing and this toy helps to develop hand-eye coordination and aiming. It is easy for toddlers to grasp the concept and fun enough to keep them practicing. Hammer Balls also has a beautiful Euro-contemporary design. The curves are sleek and fun, making it one of the most aesthetically pleasing toddler toys I have come across. It is a natural and healthy alternative to plastic toys that have chemicals and off gassing potential since it is made of natural recycled rubber wood. It is painted with non toxic dyes. As always Plan Toys has successfully delivered a fun and natural toys for kids and I highly recommend it to other moms of toddlers. « Could "Liquid Wood" Replace Plastic?